If I were to make up a list, of my favourite films from the noughties, you can bet Rian Johnson's début feature Brick would be a serious contender to grace said list. While his long awaited follow up, The Brothers Bloom, is poles apart from the ultra stylish neo-noire high school settings of his previous film the same spirit and slick ability to tell a truly interesting story still remains. 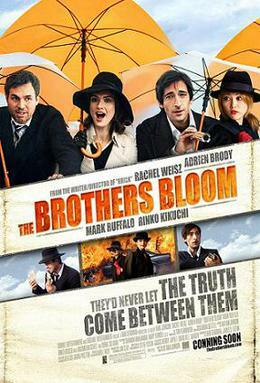 The film tells the tale of Stephen (Mark Ruffalo) and his younger brother Bloom (Adrien Brody), the best con men in the world, swindling millionaires with complex scenarios of lust and intrigue. Now they've decided to take on one last job - showing a beautiful and eccentric heiress (Rachel Weisz) the time of her life with a romantic adventure that takes them around the world. Something I felt Johnson captured beautifully with Brick he managed to, once again, recreate in The Brothers Bloom; a, seemingly effortless, ability to create a world you badly wish you could be apart of. Similar in many ways to Sorderbergh's Ocean's films in its overly indulgent settings and ridiculously suave characters. The entire leading cast of the film were taken straight out of their usual comfort zones - except Brody arguably - with Rachel Weisz truly being the person who stood apart from the rest of the pack. The Mummy films aside she's never had the chance to just let loose with a character, the way she did with her mind-boggling eccentric Penelope. Acting as the audience's vessel into the deceitful world of the Brothers Bloom, slightly naive to the nexus of their whole operation, not quite realising whether she was an accomplice or merely a victim to their overly elaborate con. While Brody and Ruffalo played on typical brotherly archetypes of "the sulk" and "the provoker", you couldn't help but be warmed by the post-modern bromance unfolding on the cinema screen. Perhaps one of the most delightful surprises was the appearance of Rinko Kikuchi, whom more seasoned film fans may know from the beautifully bleak film Babel, as the proclaimed "muscle" of the entourage with a particular enthusiasm for explosives and karaoke. It was slightly disappointing not to see her utter more than three lines of dialogue. The structure of The Brothers Bloom conjured happier memories of watching Christopher Nolan's The Prestige for the first time. Where The Prestige told the film as if it was a magic trick unravelling the narrative, Bloom delivered the ultimate con, separating the movie's scenes into the various stages of the brother's formulaic plan. Johnson gave the audience a film not bound by any specific time period, though the appearance of a very recent Lamborghini sports car reminded us all it was set in present day, the cultured European landscapes, the Orient Express-like train journeys, the extravagant hotels and apartments could have placed the movie alongside similar capers from the 1950s and early 60s, with costume design making the likes of Humphrey Bogart and James Stewart feel right at home. This was all capitulated by the glorious soundtrack from, Brick composer, Nathan Johnson. Unfortunately though there were a few instances the film was guilty of having too much style over genuine substance, with the story becoming slightly muddled mid-way with perhaps one too many support characters cropping up, such as Robbie Coltrane's irksome rehash of his untrustworthy anti-hero from his subsequent appearances the 007 films, Goldeneye and The World Is Not Enough. Furthermore it maybe suffered from being a fraction longer than needed, with the suspense to find out the twist (if there really was one?) becoming far too drawn out for its own good. The Brothers Bloom is in selected cinemas around the UK from today. For Belfast readers it will be showing at the Queen's Film Theatre until June 17th 2010. Any visitors from American can grab the movie on DVD and Blu-Ray now.